Although taxi services have somewhat broadened in recent times to centres other then Port Moresby like Lae and Mt Hagen, many if not most still lack the security and decorum that taxi services in other countries are renowned for. This leaves most tourists often too afraid to utilise said services. There is need for a modern fleet of taxis driven by well mannered, well attired cab men who are security conscious and trained to serve. 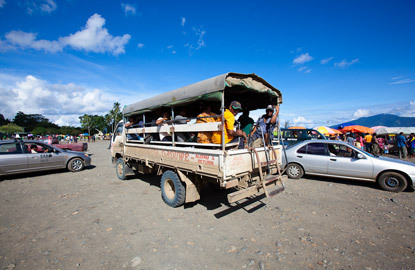 No taxis exist inWewak, Madang, Goroka and Popondetta yet tourists feel insecure walking from a venue to accommodation. Starting with Port Moresby, an investor could provide a modern fleet of clean, well maintained taxis. Public Transportation is a service that at times can be seen more as an issue. Buses are not maintained or serviced and most of the times, are unregistered driven by a driver who is unlicensed. There is need for a bus operator to provide public transportation services that rise above the status quo dawning well maintained buses, caring well groomed crewmen eager to ensure public services are delivered in the best of fashions.